Search Record in DataGridView C#. 1. Go to New -> Project -> Select Windows Form Application. 2. Create a Database (named as Sample). Add a Table tbl_Country. The following is the table schema for creating tbl_Country. 3. Drop Label and ComboBox control from the toolbox. 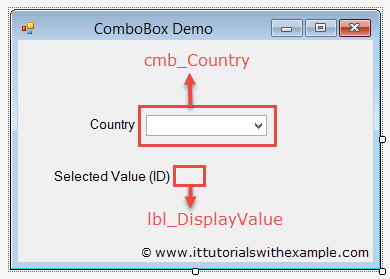 In the above code, I have created fillComboBox() method for filling the ComboBox with data and also created cmb_Country_SelectedIndexChanged event which fires when the SelectedIndex property changed. as I do not know how to write it in my application. Can you tell me what it is and also what I need to write for my application. "Data Source=. ;Initial Catalog=Sample;Integrated Security=true;" is a connection string that includes the source database name, and other parameters required to establish the initial connection with database. 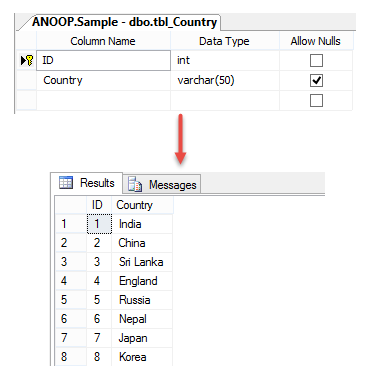 Please create a Database (named as Sample) and add a Table tbl_Country and follow each step as shown in this Post.